Blogs are a fantastic and severely underrated method of staying up to date on all kinds of interesting subcultures and industries. Sure, social media such as Facebook and Twitter can provide faster updates and hotter takes; however, the fact remains that if you want to read long-form articles of substance on a niche topic, you want to look on a blog. Accounting is no different. While a lot of interesting news and op-eds can be read through publications like the Wall Street Journal, Forbes, or Bloomberg, these are only the tip of the iceberg when it comes to finance-related written works. To help you find the best of the best, we’ve cultivated a list of the top 50 accounting blogs in no particular order. No two blogs are created equal, and these accounting and finance-related blogs are no exception. Some of these blogs are great for individuals without any professional accounting experience who are looking for advice, some of them are geared toward students looking to become CPA’s, and some are perfect for seasoned professionals looking for an expert’s take on the latest developments. These blogs were chosen based on their popularity, post quality, and post frequency. All of these blogs are also actively posting new content as of June 2018. 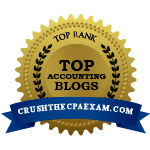 This blog is a one-stop resource for any aspiring or current CPA looking for news, editorials, and instructional guides having to do with finance and accounting. Although the web design may not look as clean as other blogs on this list, their post quality is up to snuff. This dedicated accounting blog is a spinoff of financial news outlet Bloomberg. It organizes all of the latest developments that have to do with the world of professional finance, including tax laws and emerging technology such as the blockchain. If you’ve used Quickbooks before, then you’ll be familiar with Intuit. This companion blog serves as a helpful guide for anyone who uses their accounting software, but it also provides interesting insight into the financial industry from a unique perspective. Although this blog features accounting and finance as its primary focus, an interesting secondary focus to many of their posts involves business management. This makes for an excellent blog for accounting professionals who work in upper management. Don’t be fooled by the name; this reputable finance blog with a dry wit shares no tangible similarities with satirical news outlet The Onion. Although the writers of the Accounting Onion took a long hiatus, they have resumed updates in the past few months. One of the reasons why CPE is so important for CPA’s is to stay up-to-date on the newest accounting technology and software. This blog is an excellent resource for financial professionals looking to enhance their knowledge of new tax tech without taking a class. Insight from experts is the primary appeal to this tax blog. Readers should expect in-depth posts breaking down complicated tax laws, informed advice on certain business practices, and high-quality editorial articles pontificating upon current trends. Even homeschool teachers can benefit from financial expertise from a CPA! This blog offers a niche appeal that likely will only appeal to a handful of readers. However, this important minority of educators will find a great deal of informative content on their chosen field on this blog. Who better to provide educational content than a college professor? Although his primary field of study is law, Paul L. Caron has a lot to say about the state of our taxes. CPA’s with an interest in the legal side of the business will appreciate the insight provided by this blog. As it’s punny name would imply, Don’t Mess With Taxes is a lighthearted blog that serves as an excellent primer for complicated financial subjects. This is a great online resource for aspiring financial professionals looking for tax info that’s easy to understand. If you’re a complete layman with no idea whatsoever how to go about paying back taxes, this blog is here to save the day. While it is geared toward financial neophytes, accounting professionals can still gain some insight from this blog. Rita Keller has been providing advice to CPAs for over a decade on her informative blog. In the fast-paced and constantly changing world of finance, this blog has stood the test of time by continually offering high-quality content. For a plethora of interesting blog posts written by a variety of accounting professionals, look no further than the official blog of the AICPA. This is a great site for beginners looking for the advice that only comes with experience. This is another blog where its design is at odds with the quality of its content. Look past the awkward image sizing and broken links and you’ll find a consistently updated well of informative accounting-related content. Even if you don’t operate in Maryland, this blog run by the Maryland Association of CPAs can provide an interesting take on current financial affairs. And if you do work in Maryland, you can’t afford not to follow this blog! While this blog features a perspective designed to appeal mainly to Australian tax professionals, CPAs from all over the world can appreciate the insight provided by this Australian government-hosted blog. This blog is run by the International Monetary Fund, a gigantic international organization that deals in trade and economic issues all over the world. The PFM blog can offer a valuable worldly perspective to its readers because of this. Although the jargon-heavy content written by this healthcare accountant may be too much for beginners, experienced CPAs can find a lot of useful information in this blog, regardless as to whether or not they work in healthcare. More of an online textbook than a traditional blog, this online resource is updated frequently to provide valuable educational material for aspiring accountants and financial analysts. Established CPAs can use it to brush up on concepts as well. Are you interested in becoming a successful accountant? Well, one of the best ways to do so is to learn from accountants who are already successful. This is the primary appeal of this blog, and it serves its purpose beautifully. Don’t come to this blog expecting some light reading material. This is a highly informative and information-dense resource that will provide valuable insight to established CPAs and similar financial professionals. Everyone knows that the Big 4 accounting firms (PwC, Deloitte, KPMG, Ernst & Young) set the pace for the rest of the financial industry. For that reason, this blog provides updates on the newest developments to come out of these firms, as well as highlight potential career opportunities. Although its stark white design may lead you to believe that this is another stodgy jargon-filled blog for experience tax professionals, the truth is that this blog regularly publishes content that is easy to follow and perfect for the less experienced. This blog has less to do with the practice of accounting or financial analysis and more to do with offering marketing advice to accountants and financial analysts. It’s an important facet of any successful business, and accounting is no different. As the official blog of a substantial think tank dedicated to taxes and financial policy, this online depository of articles and journals is extremely valuable for the knowledge and expertise they provide to the reader. If you need to accomplish an accounting task without having any prior knowledge, 5 Minute Bookkeeping has you covered. Veronica Wasek has hundreds of posts on her blog explaining accounting tasks in five minutes or less. This vast network of accountants and assorted financial professionals have taken some time out of their busy schedule to regularly upload quality written content on their blog. Expect valuable knowledge gained from experience. With a structure closer to a periodical, this blog still manages to provide consistently high-quality posts and articles discussing the world of taxes and finance. The handy subcategories on the header are a nice touch. This professional CPA company operating out of North Carolina offers intriguing blog content regarding different facets of professional finance. Whether it involves crowdfunding, LLCs, or education, they’ve got something interesting to say. If you’re interested in the latest and greatest accounting tech but have no idea which offerings are worth your time, the fine folks at GrowthForce have you covered. Their blog is an excellent resource for this exact purpose. AccountingWEB is another standout finance blog that offers a sleek aesthetic, making it easy to navigate their top posts and stories. It’s nothing particularly unique, but it does a terrific job of being average. The often-overlooked but extremely important realm of forensic accounting is the primary focus of this blog. Regularly consulting this website can provide valuable information on how to avoid financial pitfalls. Although its initial appearance suggests a PR wing of an accounting business, the actual content that lies in OSYB’s blog is substantial enough to stand on its own. Expect hot takes and informed commentary. This blog doesn’t update as frequently as others on this list but they are still active. All posts on KLR’s blog are authored by working accountants and financial professionals, offering their much-needed insight into current financial trends. This accountant’s blog comes with some attitude on the side. For people who want to read informative content regarding finance but don’t want to be bored to death, The Blunt Bean Counter offers a refreshingly amusing tone. With a focus toward small businesses, this blog covers accounting tips and strategies that self-made financial professionals can use. CPA’s can even refer some of these resources to their clients if they run small businesses. Although they don’t offer much in the way of original content, Rea and Associates is a fantastic aggregator of large stories that relate to accounting and tax law. Consider this blog as a carefully curated news feed. This blog is best considered as a supplementary text for Quickbooks users. However, their regularly uploaded articles focus more on general finance and accounting concepts rather than simple software instructions. Drawing from over 25 years of professional experience, Fred Abrams created the Asset Search Blog to impart some of his forensic accounting information onto you, the reader. Expect valuable insight into asset recovery. Another interesting forensic accounting blog is Phillips & Cohen, run by the titular attorneys. With a primary focus on whistleblowers, this blog can provide interesting information for accounting professionals regarding unsavory financial practices. This blog isn’t for casual readers with a passing interest in accounting or finance. This is a dense, high-level blog that features extremely in-depth discussion on a variety of nuanced topics. You have been warned. This is another accounting blog written by a professor, which would explain the Spartan web design. Beneath its crude exterior, however, lies a wellspring of knowledge previously only available through a university course. With a focus on modern tax reform, this blog is an excellent way for aspiring and practicing CPA’s to stay on top of the newest trends, technologies, and controversies surrounding the modern tax code. Although a CPA is expected to parse all of the dense writing that comes with regular changes to the tax code, this blog can be a nice shortcut if you’re looking to save some time. Expect easy to read breakdowns on complex developments. Australia-based financial software designers MYOB have an interesting blog discussing pertinent topics in the realms of accounting, industry, and business leadership. It’s a potent triple threat perfect for CPAs. When you’re starting to feel like your brain is turning into mush after reading about taxes and quarterly earnings and audits, give yourself a mental break by enjoying some of Mark Lee’s accounting jokes. Financial Executives International is, as their name would imply, an international organization of financial executives. Their website’s blog focuses mainly on financial analysis, making for a terrific CFA resource. Freelancing can be a gratifying career move, but it’s also stressful and fraught with uncertainty. Gabrielle Fontaine created this blog to help alleviate some of the anxiety associated with freelance accounting careers. Coming out of the United Kingdom, this slickly-designed blog offers insight into cost-cutting techniques for accountants and other financial professionals the world over. However, it doesn’t update very often. While it’s name may evoke images of violent dog crime, the reality of Professor James Maule’s blog is much more mundane. This is an excellent online repository of tax and accounting information from an educated author. Did we miss any essential accounting blogs? Which one is your favorite? Let us know in the comments section to keep the conversation going! Hi there, thanks so much! We're glad you found it useful!